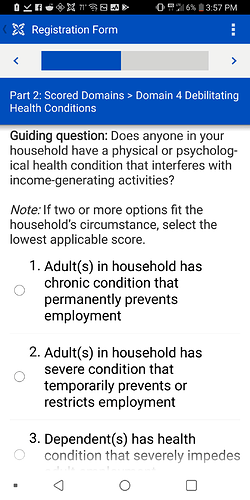 Whenever we test our form in mobile apps, it functions correctly and shows the two labels we created to show two score( a dependency ratio, and total score from the category. However, whenever we do a test form on a mobile device. 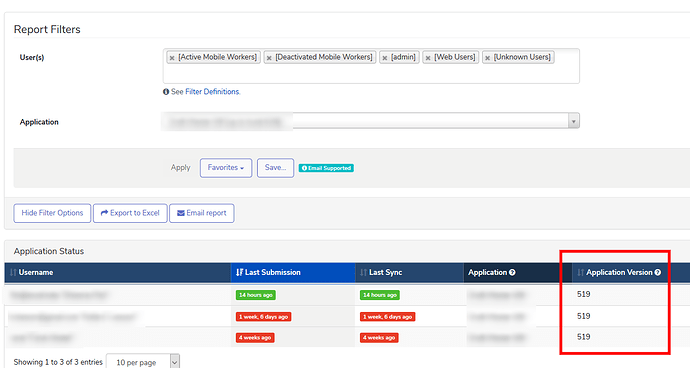 It does not show the two labels, and subsequently does not show the scores to the mobile worker. 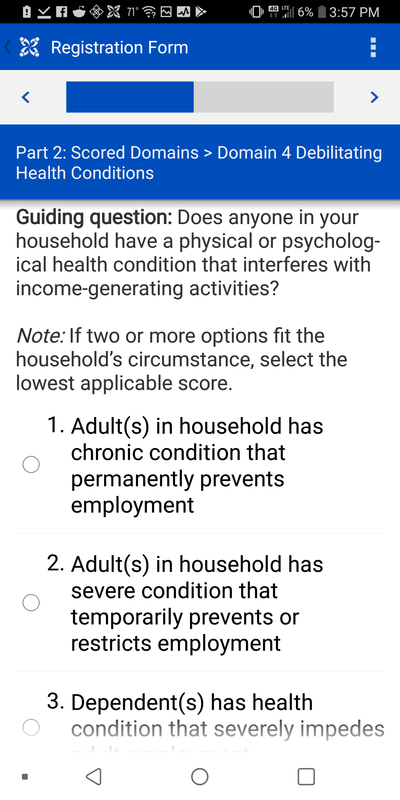 The app just completes the form with not showing these labels. Would anyone know what’s going on here? Or what I should check to correct it? Can you confirm that you have the latest version of the app installed on the mobile device? When I run your submit history report, it looks like all the forms were submitted from the 519 version of the form, not the most recent version which is 562. Can you confirm how you’re checking for the latest version? 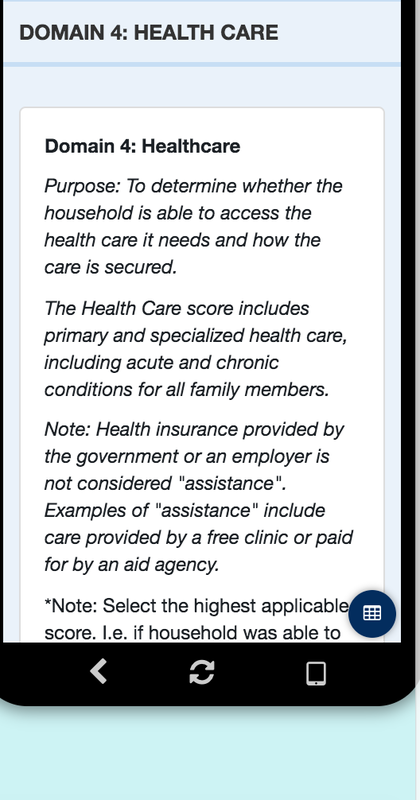 You can follow the directions here: https://confluence.dimagi.com/display/commcarepublic/How+to+Update+CommCare+Application+Content#HowtoUpdateCommCareApplicationContent-DeterminingYourCurrentAppVersion. I can confirm that we are indeed discussing 519 version. 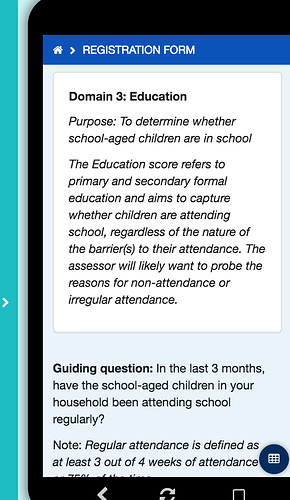 I have created a new version (562) but we are not yet ready to deploy it, which is why I am attempting to correct our current issue of why the labels are not showing in the mobile version (which we are currently using). I do know that the mobile web apps format does show the ‘domain average’ label as well as another label called ‘dependency ratio’ while the mobile version of 519 does not (which is what the field team uses). Thank you so much for your response. I found your links useful, and applied them before responding to your post. TCP communication or Js issue or issue with delivering expected response. It’s super weird, everything is pretty perfect in live preview but then on the mobile apps it seems latent (even referencing old questions that have been changed). 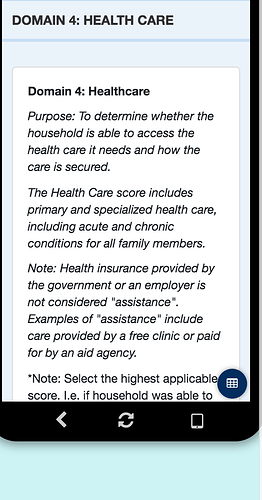 Domain 5: Education was changed to Domain 3, and Domain 4 Debilitating health conditions was changed to Healthcare but the mobile app has not updated it (i believe).